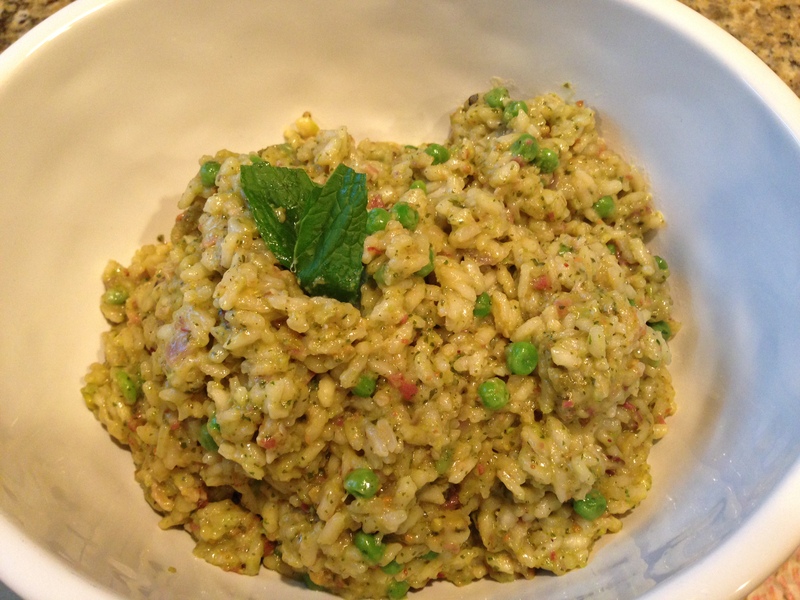 My favorite risotto – thanks to Rachel Ray! | Fabulous Weekend Cooking!! ← The only prime rib recipe you’ll ever need! I seriously think this risotto rivals any found in Gordon Ramsay’s restaurants! You need some time to make this, it takes about 15-20 minutes of prep and another 25 minutes to cook. 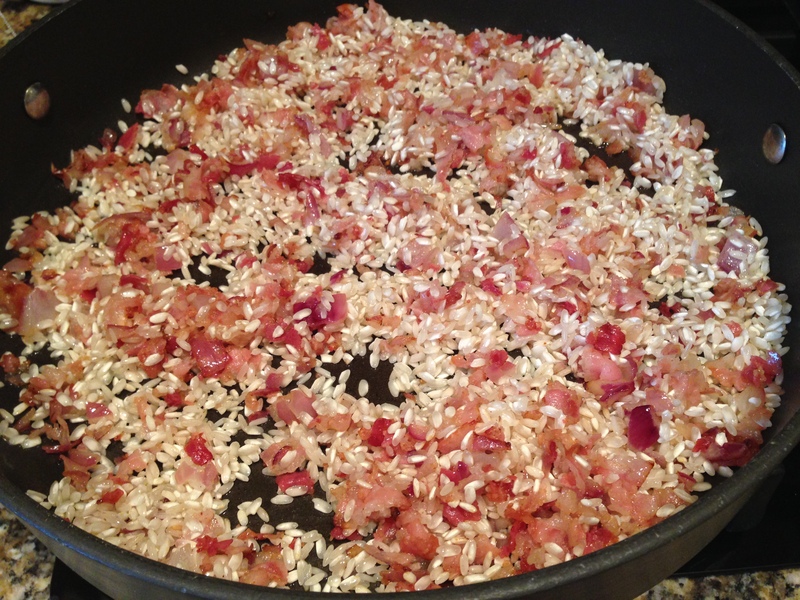 With risotto, you can’t just leave it covered on the stove to cook like other rices, you have to babysit and stir it the entire time. It’s not difficult, just time consuming. I can’t figure out why the people on Hell’s Kitchen can’t ever seem to cook it properly?! If you’re having company over and don’t want to spend the whole time in the kitchen, you can cook this ahead of time and just reheat it when you’re ready to eat. This is enough to feed 6 adults. This is an excellent side dish for a nice steak dinner! In a food processor, pulse the parsley, mint, tarragon, cheese, pistachios, garlic, lime zest + juice, and half the peas; season with salt and pepper. 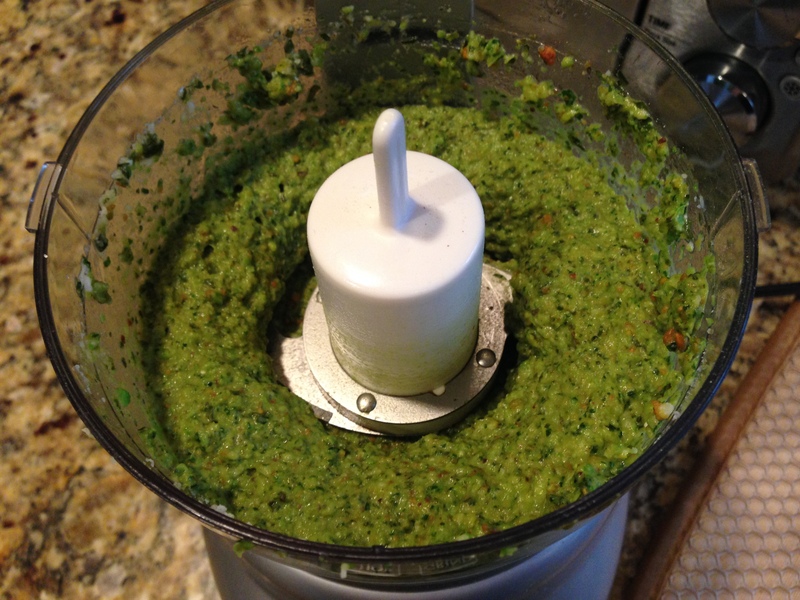 Pour in 4 TBSP EVOO and pulse into a thick pesto. If too thick, add 1 or 2 more TBSP EVOO. In a large, deep saucepan, heat 2 TBSP butter over medium-high heat. Add the pancetta and cook, stirring, until starting to brown. Add the onion and continue cooking until onions become translucent (3-5 mins). Stir in the rice and stir to coat for 1 minute. Stir in the wine and cook to evaporate, about 2 minutes. Ladle in the warm stock a 2 ladlefuls at a time, stirring to develop the starch and waiting until all the liquid is absorbed before adding more. During the last minute of cooking, stir in the additional 2 TBSP butter (optional), the pesto, and the remaining peas. Taste and add additional salt and pepper if necessary. I am a mom of 2, happily married, work full time, and one of my favorite things to do is cook elaborate meals on the weekends! I also love to read, I'm a movie junkie, and if I win the lottery I will spend a good portion of my time traveling the world! Soccer has also been a great love of mine - I still play soccer (run a league in NJ) and have been playing since I was 4. This entry was posted in Side Dish and tagged Hell's Kitchen, homemaderisotto, peapistachiorisotto, risottowithmintpeaspistachio. Bookmark the permalink.